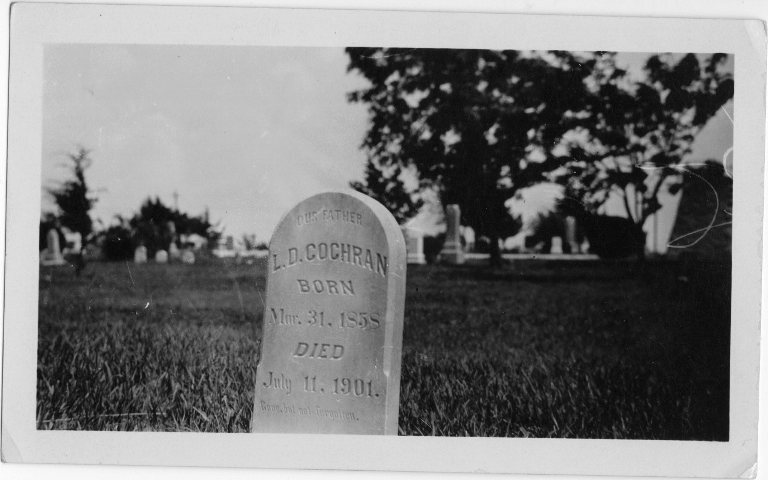 In my post Virtual Hike to Hays, Kansas I told the story of the death of my Great, Great Grandfather Lorenzo Dow Cochran. I had mentioned that in a visit to the library in Hays I had found an article about his death, but did not know where I had tucked it away. Tonight while searching for something else I ran across the copies I had made from the microfilm machine. The first article comes from The Republican which was the Official Paper of Ellis County. 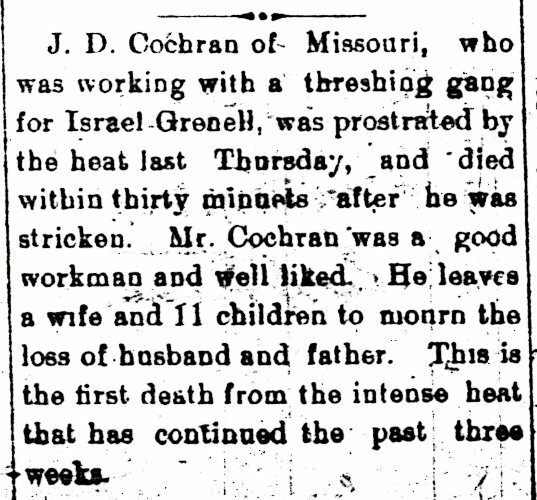 J. D. Cochran of Missouri, who was working with a threshing gang for Israel Grenell was prostrated by the heat last Thursday, and died within thirty minuets after he was stricken. Mr. Cochran was a good workman and well liked. He leaves a wife and 11 children to mourn the loss of husband and father. This is the first death from the intense heat that has continued the past three weeks. The article has J.D. Cochran instead of L.D. but the rest of the facts about him are correct. There was also an article in the Free Press. It is important to remember that a century ago many cities had competing newspapers, so always look for alternate reports when searching for your family history. He formerly lived in Norton Co and his wife and family are visiting their old home in Missouri. Again we see that the initials are wrong. This time is is J. 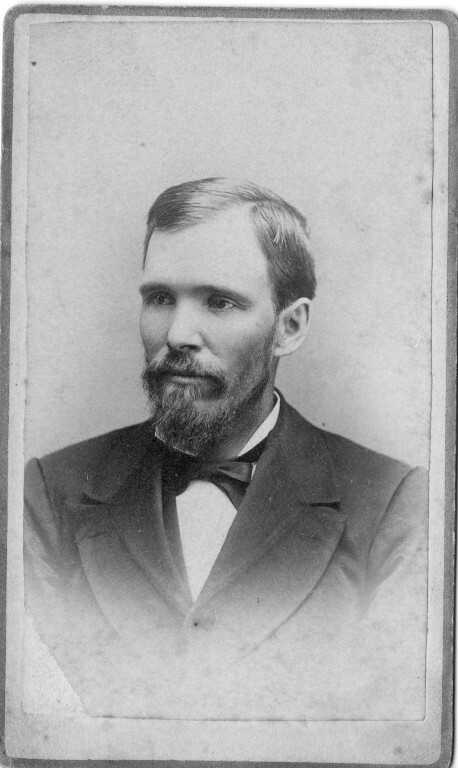 B. instead of L. D.
He indeed previously lived in Norton County, Kansas and his family was back in Missouri. At some point I will try and find the approximate place of his death. I am sure that there are plat books that will show where Israel Grenell owned land in Wheatland Township in 1901. There is a bit of difference in the cause of his death. I would tend to believe that it was due to heat prostration rather than heart trouble as he was only 43 years old and in good physical shape. Or, perhaps those family stories about him being murdered are true. Now to try and remember where I tucked the other item away. 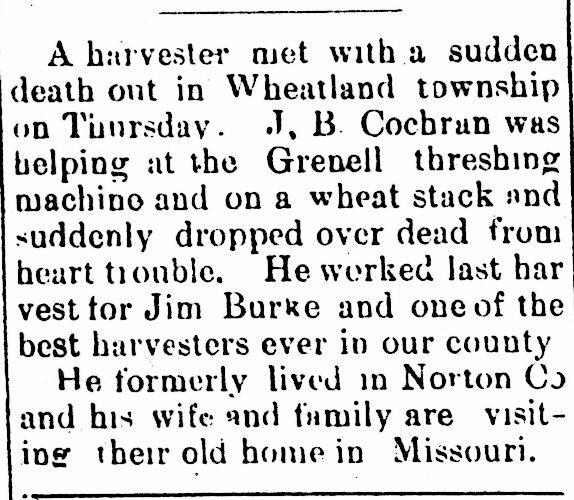 This entry was posted in Culture, Family History, Genealogy, History and tagged Harvester, Hays Kansas, Lorenzo Dow Cochran, newspaper, Thresing. Bookmark the permalink. Steven, thanks so much!!!! The family always said he died of heat stroke. I haven’t heard any stories of murder … dum dum de dum. Have already shared this with my brother and sister – I’m sure they thank you too! !